The Moving Die Rheometer MDR- 3000 measures the change in stiffness of a rubber sample. The sample is compressed between two heated platens and by an applied oscillating force. The degree of vulcanization determines the cure characteristic of the sample as it is heated and compressed. Our Moving Die Rheometer offers affordable testing and stunning results. We offer sealed die and un-sealed die type configurations to suite your application. The Servo driven system provides extremely steady oscillation frequencies as well as low noise to ensure test accuracy, convenience and increased lifespan of the machine. Operated with a remote computer via RS-232, we can analyze results taking data at 100,000 readings per second. The machine allows for selectable times and torques during setup or in testing to accommodate limitless configurations. You can monitor the test from the computer or large LCD displays on the front for in test evaluation. The design features Modular internal parts for in house servicing and overall easy maintenance. 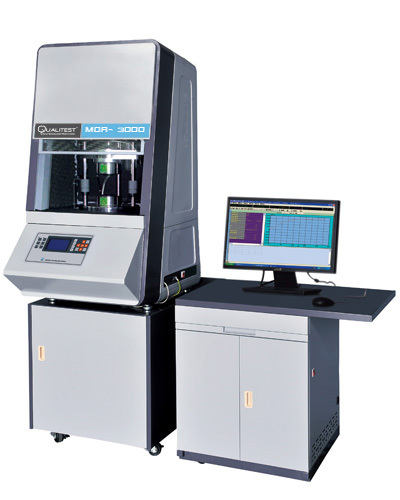 The Moving Die Rheometer MDR- 3000 SOFTWARE: Software is an integral part of any testing apparatus this is why we have developed a program to work dependably with our machine and intuitive with the operator. The software allows you to configure a variety of tests. Auto detection makes this program simple to setup and initiate testing. Safeguarding data is an important factor so we have an automatic back-up system to ensure data will not get lost. For the operators comfort, the program is customizable in terms of fonts, color settings, beep alerts and selectable measuring units. There is an Import / Export function which allows the user to exchange data from one format to another. (Example: export data to Excel) Customizable reports allow the user to determine up to 300 different parameters including multiple charts and tables so your reports can look just the way you want them.